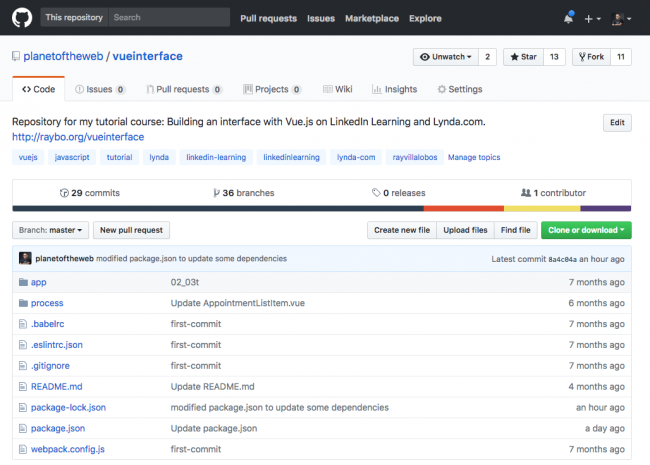 The Vue.js framework is quickly gaining in popularity, and although it won’t have the market share of other frameworks for a while, more and more companies are considering it for projects. So let’s dive into how it compares with other frameworks and some of the reasons why it might be your next framework. I’ve built a similar application using jQuery, React and Vue.js. You can see a sample of the working app built with Vue.js here. In a way, getting started with Vue.js is similar to getting started with a framework like jQuery and the original AngularJS (Angular 1). Although you can install the framework in a couple of ways, just like with jQuery, you can simply load up a script tag from either a CDN or a single script tag to get started. That’s all you need for most simple applications. Compare that with Angular’s quickstart, or even React’s installation process where you must depend on a complex terminal Command Line Interface (CLI) to get even simpler applications working. Simplicity matters when you either want to get simple things working without a lot of overhead or are just starting to learn the features of a framework or library. From jQuery’s perspective, you can see that Vue.js is an entirely different animal. Templating or data-binding is something that you have to add to jQuery as additional plug-ins. Let’s look at a more complicated example and the next reason why people are switching to Vue.js. If you’ve never seen this type of coding before, it will probably freak you out, because it requires a shift in thinking. In Vue.js and other modern frameworks, the application’s state is what drives what is happening in your interface. We don’t worry so much about manipulating elements in the DOM because our application ‘reacts’ to the value of data instead. From now on when the value of the hidepanel variable changes, the visibility of that panel changes as well. So then it become easier to modify your interface because all you have to do is modify the data. Let’s say, for example, that you wanted to hide the panel when a user submits a new appointment. With jQuery, you’d have to remember to issue a .hide() method on the DOM element. With Vue.js, you simply set the hidepanel variable to true. The difference is that with Vue you’re never really worried about what the DOM is doing, you’re always just changing values in your application. This reminds me of the third reason why people switch to building applications with Vue.js and that’s the Virtual DOM. The virtual DOM isn’t something that’s unique to Vue.js. It’s one of the reasons that the React framework is so popular. The virtual DOM means that the framework takes care of making changes to the DOM for you. The DOM is a representation of what the page looks like. Frameworks like React and Vue.js create an intermediate DOM, called the virtual DOM. This virtual DOM gets updated only when it needs to be. Say, for example, that you create an application that shows the first 10 records worth of data and then you fill out a form that causes a record to be added at the end of that list (an 11th record). Instead of redrawing the website, the framework writes the changes to the virtual DOM as if it were the regular DOM. Then Vue.js compares the virtual DOM to the regular DOM. Since you’re only displaying the first 10 records, it notices that no changes need to be made to the real DOM. If you take a look at this application, you can see that Vue.js injects your DOM with lots of data attributes and updates it on the fly as your data changes. The data drives the interface when you do a search or when you delete an element. Here’s some code for a component in Vue.js that displays this list. This code is pretty simple and it doesn’t show the template for the individual list items, which is being imported in line 11. You can find that code here. But you can see that this component receives some data from the main component in a variable called appointments and then lists the items in that list. The important thing is that this component has a single, very focused job… to display the list. It doesn’t care about what happens when someone adds or deletes a record. The virtual DOM works with Vue.js to react to changes in our appointments list. When it notices a change, it looks at this component and writes any changes from one of those operations into the virtual DOM. Vue.js then compares that with the actual DOM and updates it only if it needs to. The virtual DOM is Vue.js’ killer app. It just works and makes working with the DOM faster and more efficient. All modern frameworks like Angular, React and Vue are based on a component architecture. That means that we no longer write huge applications, but break them up into mini components that we put together in order to create larger apps. This is especially powerful when combined with the rest of the reactive virtual DOM we’ve been looking at. You can break an application up into pieces and each piece can focus on performing a specialised task. So, you could break an application into a component that displays a list of records, another component that allows you to search through those records and another one that allows you to add a record. Here’s the actual code in our main component. This code is beautiful in its simplicity, but it also reveals that our components only need to worry about few things. Data is passed to a component via props or properties that look like HTML attributes, so our appointment list gets passed :filteredApts. 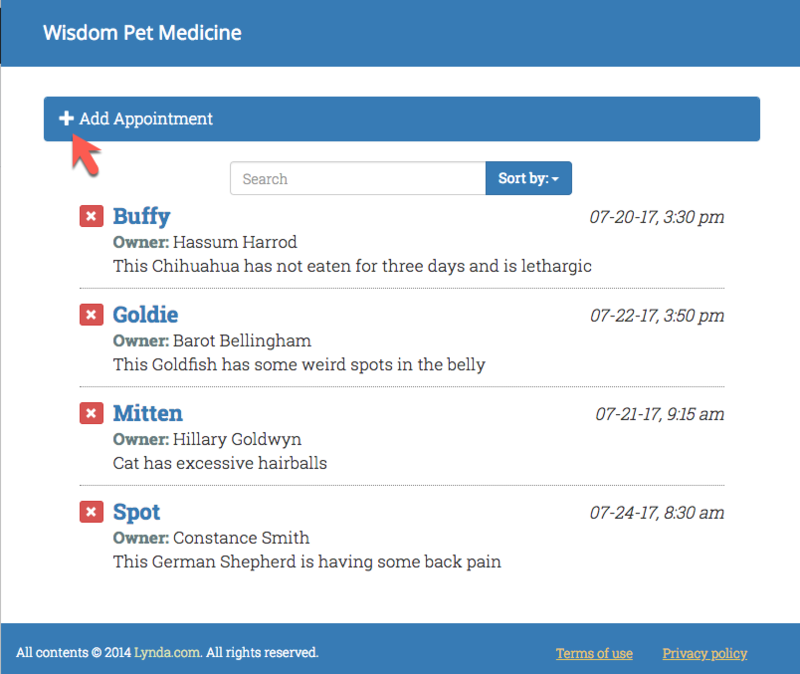 These are appointments that have been pre-sorted by search or sort. It also receives information should a @remove event take place (more on that later). The beautiful thing about Vue.js is that our components don’t need to be worried about what the other components need to do. Our list component is only concerned with listing data, our search and our add components only worry about their individual functionality. 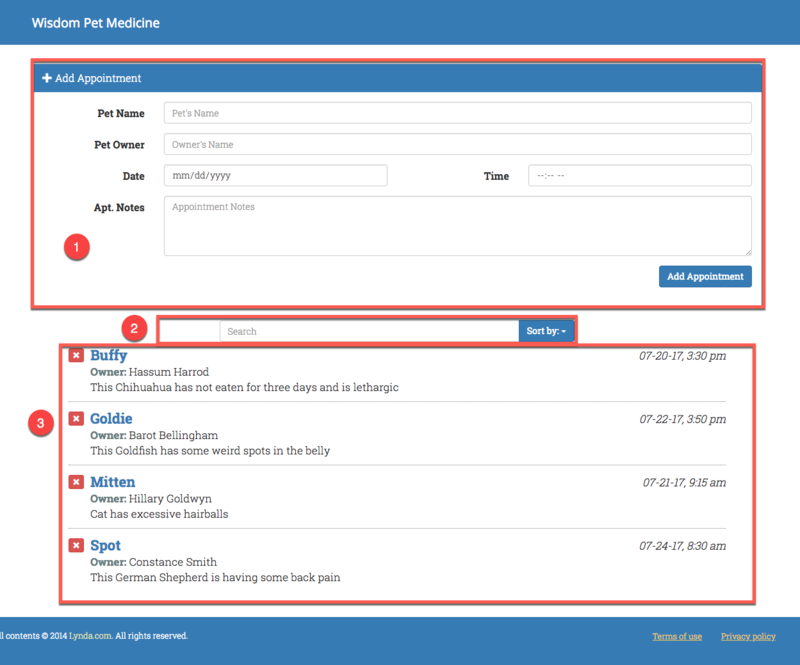 Let’s say that our add-appointment component adds a record to our data. Our appointment-list component will simply notice that a change has been made to the app’s data and redraw our list based on the new data. With something like jQuery, you have to do two things, modify the data and update the DOM based on that modification. With Vue.js, you only worry about modifying the data. Each component works independently from each other to do its small tasks. It makes applications easier to manage and update. If you need to, you handle communication between the components through internal events by emitting custom events when things happen. The events pass information between components and can make it easier to manage the application. That’s another reason people really love these new framework structures. Events in Vue.js can help you make your application easier to manage because they can be passed along through the components up to your main application. Let’s take a look at how we would go about deleting a record in our application. This simplified example from our AppointmentListItem component shows you that you can capture events inside individual components, but because our events are designed to modify data, it’s better to send these events up our component chain to the main component. So we have a local method called requestRemoval() that passes information about the appointment to be deleted to our main App.vue component. This component runs a separate event, called removeItem, that deletes the data. Here’s that entire function. I’m using the awesome lodash library to remove an element from our data, but you’ll notice that at no time do I worry about the DOM in this sample. I simply have events navigate through the components to modify data. The rest of the app is similar, my search or sort modifies the fiteredApts variable. When that changes, the list will automatically be re-drawn. Nice work on this article! Hey RAY VILLALOBOS great article!